So November is Epilepsy Awareness month. And purple is the color assigned to epilepsy awareness. I remember getting the boys all purpled up for epilepsy awareness month in 2013. But we were still seizure free then. Had been for years. And I remember thinking how those seizure-fighting-warrior parents were my people, but also that I was feeling somewhat disconnected because, well, we weren't fighting that giant anymore. No seizures. No meds. No fear or worry that they'd ever come back. In that very same year. 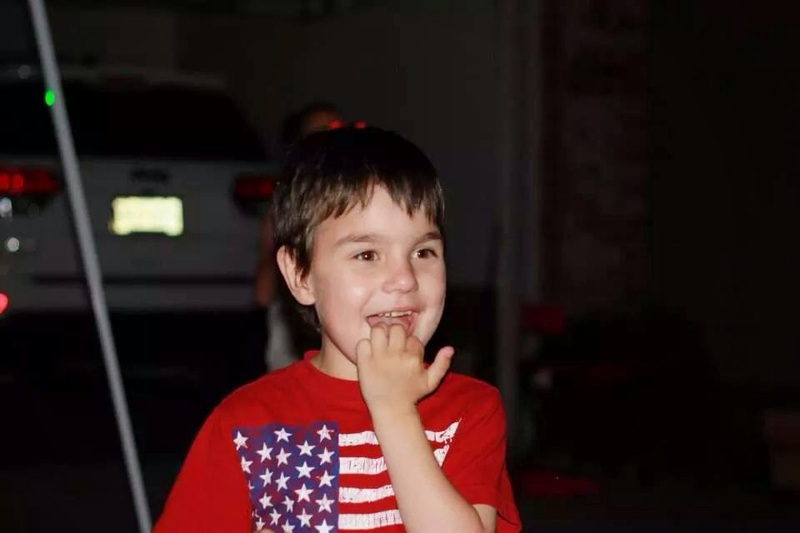 Luke had a seizure three days before Christmas in 2013. In the middle of the night. Such a horrible time to have a seizure. And since it had been so long since any kind of epileptic event, it was considered his first seizure really. His first of that kind. Really epilepsy?? You come sneaking in in the the middle of the night. Unannounced and uninvited. No wonder so many people hate you. Luke had a second seizure 4 months later. Then we started meds and enjoyed almost a full 12 months with no seizures. Then 2015 came and the seizures have come more frequently. Five this year. And as much as I try to talk myself down and calmy tell myself that MANY people are living with epilepsy and that no matter how bad it gets, I have friends who have walked (are walking) this road and they're making it.... the fact is, seizures are just an altogether different kind of monster. Luke's seizures are mild(ish?) in nature. But they're too long and, so far, have always required us to administer an emergency med to stop them. And a couple have been sneaky...happening in the early morning hours or later in the evening. Two of them we have missed completely and walked in to find him in the the post-seizure state. We're not real sure how long those lasted. So, yes, the truth is this IS the normal for soooo many families. So many. We are not alone. But I can't deny the stress that it does in fact add to life when seizures are not controlled. And, at this point, I'm not sure we can say they are controlled. Of those 5 seizures, 4 of them have happened in the last six months and 2 of those in the the last month. There's definitely something going on...now to figure out what that something is. After his last seizure on Oct. 22nd, I called up to neurology to request that we PLEASE have an EEG scheduled that we please move up our next scheduled appointment, which isn't until Dec. 10th. That seemed reasonable to the nurse on the other end of the line, so she got the ball rolling. Luke had an EEG a week ago today. We found out the EEG is unchanged from the one he had in 2013. So, that is some relief. But still we are left with the reality that despite increasing the medication dosage in June, the seizures have only become more frequent. Considering that, I really wasn't expecting the nurse to call me back and say, "The doctor just wants to keep your Dec. 10th appointment. For now, let's increase the med dosage again and see if that helps. " Me: "Ok. Uhm....yeah, I mean I'm not completely against that idea. He has had a growth spurt and it may be possible that he just needs more of it. But the doctor does know that we just increased the med in June, right? And things have gotten worse and not better. Is there a chance the med is causing the seizures?" Nurse: "Well, I guess we'll find out." I know that's what she had to say. She had a job to do and she did it. But, gosh......"just" increasing the med and waiting to see if it helps or is going to make things worse is easier said than done. It also doesn't sit well with me that the neurologist calling the shots has never once met Luke. Luke's previous neuro retired. This is the new one. He's not making a great first impression. I'm almost positive he could find SOME time to see us before Dec. 10th. Or at the very least 5 minutes to talk to me over the phone. I don't know. Maybe not. 1) We pray everyday that according to God's will, Luke will be healed and not have to endure another seizure. Ever. 2) We need wisdom. Lots of it. Anti-seizure medications are helping millions of people around the world. We're not against them by any means. We don't want to withhold anything that Luke needs. At the same time, we don't want to give him something that will make things worse. Wisdom. 3) If you've been this journey with us since the beginning, you know we opted out of all meds in 2009 and tried some more alternative approaches with Luke. Pray the Lord speaks to us in these regards. It was very easy to make that decision in 2009 because I knew (that I knew that I knew that I knew) that God was directing us to do that. We need that same kind of clear direction. 4) Finally, just peace. In all things. Luke belongs to Jesus. We can't watch over him 24/7. But Jesus can. And we trust Him. Oh for grace for trust him more. Everyday I pray that God will allow Luke to be able to communicate. He has words. He uses words. Sometimes in context, often not. Sometimes he chooses his words carefully.... often he just repeats the same word or phrase over and over (AND over!). Sometimes, he can speak at an appropriate volume. Often he's screaming at a level that's so loud, you're sure the next door neighbors can hear him. But it's in there. He's in there. Luke. And you can see it. And it's excruciating. For me....and for him. He wants to say something...but it just....it can't come out. "Jesus, at the center of it all. Jesus at the center of it all......"
Last week at his doctor's appointment, Luke's neurologist was trying to engage him in conversation. How old are you Luke? What color is your shirt? All questions he can answer. "Jesus at the center of it all. Jesus at the center of it all. From beginning to the end it will always be, it's always been you Jesus....."
And I smile and blink the tears away. And hope and pray that one day Luke's words will come. And then, too, I remind myself that while the body may be frail and broken, the soul is not. One year ago today, we were blessed with this sweet girl. How can we even put into words what a JOY she is to our family? She's makes all of us so happy! Caleb helped prepare and we put together a fun little "Sprinkle party" for her. Life was already so sweet when we found out Hannah would be joining us. I mean Andrew and I had already been showered with so much love from our Heavenly Father. With precious friendships. With miracles. With peace and grace and mercies new every morning. God is so good. Life was sweet, but the gift of Hannah was like sprinkles on top of it all. It was like God was saying, "Not only that....I'm showering down extra sweetness on all of this." I hope to write more about her soon, but for now here are some pictures from her special day. Caleb helping get the food ready. So earlier today I said to Andrew, "Mmm...I didn't really think about her birthday dinner. What would she like for dinner?" Probably in a bit of a sleep deprived state, we decided that since she loves Cheerios.....we should go splurge on a few of the many, many kinds of Cheerios you can find these days. So 'breakfast for dinner' it was. The kids were thrilled. :) Ahh...memories. Ha! Then, she went for it! I got too distracted and didn't take any pics of her opening presents. But, at the end, we let Luke give her a new box of Kleenex. Just what every one-yr-old wants. :) She loved it!! She got to pull out as many she wanted. She kept pretending to blow her nose. Ha! Things are looking up for Luke and we couldn't be happier. The extreme meltdowns seem to have subsided for the most part. Not that they don't EVER happen. But it's fairly infrequent....maybe once or twice a month. And even when they do happen, it's been easier to talk him down. For several months, when Luke would have a meltdown, it was like he was caught in a circuit and there was no coming out of it. It was like the meltdown started and quite literally his brain couldn't come out of it without just riding it out..until it was over. Usually 30 or 45 minutes. Which of course felt like hours. Because it was 30 minutes solid of screaming, crying, kicking, biting, head banging, and other various forms of self harm. Truly intense and truly unbearable in many ways. Needless to say, we are thankful for not having to live this reality multiple times a week. Thank you for praying! I wanted to write a bit about Luke's school. I'll never forget after the boys were born and we realized Luke suffered some significant damage to his brain. Someone said to me at some point (the specifics are somewhat foggy), "Oh my goodness. What will you do if they can't be in the same class at school?" I don't recommend asking questions about something that will happen in five years. There's grace for today, folks. Especially when it comes to special needs parenting. We basically have a game plan for like...well, today. And maybe next week. But everything is evolving constantly. And well, our morning cup-of-joe is getting us through the right-here-and-now moments. And, I ask God to be my portion..today. My DAILY bread. Tomorrow will bring new mercies and new strength. So, I wasn't thinking much about Kindergarten at that point. But, as the months and years passed, I did think about Kindergarten. A lot. The truth is, it would be very rare for even typical twins to be in the same kindergarten class. At least in our part of the country, the norm is to separate twins. So, the thought of them being in the same class was never really one I considered. But we did OFTEN pray that by the time they started school, Luke would be caught up enough to attend a regular Kindergarten class. So, September came around this year and it was time. Time for this. CALEB'S first day of school. I was so ready and so not ready. We dropped Caleb off at his school first. I totally lost it. So much so that Andrew had to walk Caleb in while the rest of us stayed in the car. Of course, I held it together for the good-bye. I smiled big and told Caleb I knew he would have a great day. He was SO excited for this moment and not at all nervous, so that helped a lot. But once Caleb and Andrew got out of the car and started walking in, the reality of it all came crashing down. Sometimes in this life, grief comes 'round again. You can't push it away or make it disappear. You just tip your hat and acknowledge it. And allow the tears to fall. There's no guilt in grief, for goodness sake. Some days, you just grieve the might have been. The picture you had in mind when the doctor said, "There's two in there!" You imagine they'll be inseparable. Best buds. Living life and experiencing life together. But there was no 'together'. It wouldn't just be separate classes. It would be separate schools altogether. For one reason: Though identical twins, our boys experience life completely differently. One, the way most healthy, typical children experience life. And the other, as one who has experienced a great deal of challenges. Sickness. Feeding tubes. Surgeries. Seizures. Delays. Impairments. Disability. Diagnoses. At the end of preschool last year, our school district called a meeting. Then another meeting. But after those meetings happened, more meetings were scheduled. And we came to realize our school district was grappling with one question, "Just what do we do with Luke for Kindergarten?" One day last Spring, we sat around a table with 8 different teachers and therapists. All so knowledgeable and all concerned that Luke would have optimal placement. We agreed to reconvene, as no decision had been made. In fact, out of the eight staff members present, there were SEVEN different opinions on where Luke should be placed. We prayed. We fasted. We toured schools. We met with principals. We thought we knew what was best. But as time went on, even WE didn't know where we should place him. Finally, a decision was made that Luke would be placed in a newly formed class at Park School. Park school is a facility in our district for multiple-disabled children. I had visited the school. And while I impressed with the staff, I just worried about the lack of exposure to typically developing peers. Luke is in an interesting place in his development. He knows about as much as any kindergartner in some ways. He knows his letters and their sounds. He can recognize some sight words. He knows his numbers. He can count objects. He know his colors and shapes. He can sort. He knows a great deal of information. And yet....his delays and disabilities limit him significantly. The visual impairment requires he have many modifications. His sensory processing issues make a regular kindergarten environment unbearable for him. The size of the room, the amount of children, the lack of certain kinds of structure, the noise....it would all be excruciating for Luke. And certainly would not provide an optimal learning environment. The day after we dropped Caleb off for his first day of Kindergarten, we dropped Luke off for his first day at Park School. It's hard to even express how perfect this classroom is for Luke. It so incredibly organized and structured. There are only 4 students in the class. One teacher and two aides. A dream for a special needs parent!! That means, he is almost always getting one-on-one attention/interaction. SOO hard to find this kind of set-up in a public school. Luke is excelling! He LOVES going to school. His language is blossoming. His skills improving. His overall mood is just....happier. We see him interacting more with Caleb and Hannah at home. We see him being more able to handle various "stressors". Most of all, God had led us to a group of people who truly love Luke. They accept him for who he is. They push him to do better. They're patient on the days when he is not at his best. Simply, they just want the best for Luke. And I guess even more than that...they ENJOY him. They don't just educate him and help him and check the boxes when he achieves a certain goal. When I drop him off in the morning, I can just tell they are genuinely excited to see him. And really, what else could we ask for? I stand amazed at God's great faithfulness....to us, yes. But also, to Luke. We moved here to this city for one reason. Northwestern University. Because God called us here. It was (and is!) a leap of faith. We couldn't negotiate with God. We did it...trusting that every need would be met. That our kids would attend the local public school and it would be what was best for them. And I guess, at the end of the day...it shouldn't surprise me. But to think that God has so carefully positioned us. So carefully helped us find an environment that is so helpful for Luke. Thank you, Lord!! And while "The first day of kindergarten" for our boys may not have looked like what we thought or even what we prayed for, we are filled with humble gratitude that it was filled with a kind of beauty that only comes from God. And in many areas of my life I'm finding that Jesus knows our grief, but He graciously invites us to come and see HIS plan and HIS ways that are so much better than ours. We've had some good days. We've had some bad days. Good news is....Luke hasn't had any noticeable seizure activity since April. Truly grateful for that! And we don't take for granted any seizure free day. We are fully aware of the reality we could be facing in these regards and we thank God for graciously keeping Luke seizure free. Overall, he is going fairly well. Luke LOVES summer. He loves being outside, loves walks, loves swinging at the park, loves swimming and any kind of water play. He loves fireworks. He loves listening to birds in the morning. For many reasons, summer is by far his favorite season! So, we've had some happy days recently. 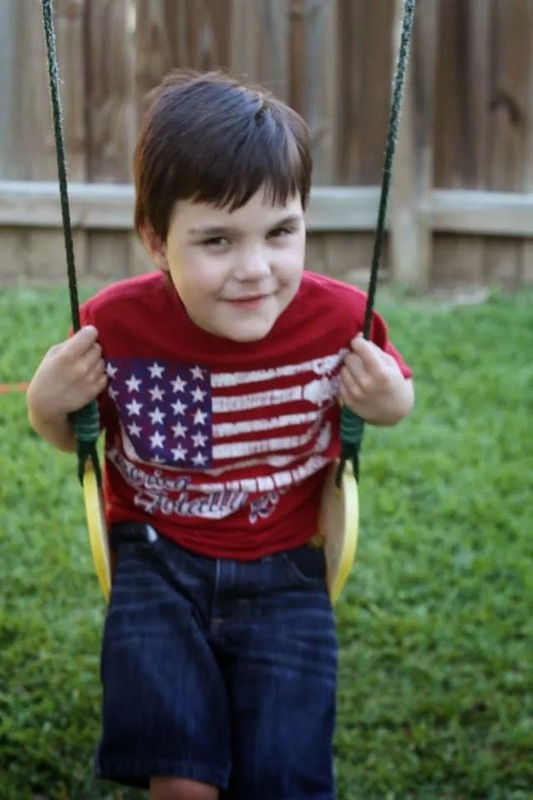 Last month, Luke's neurologist changed his seizure medication. We are now on medication Number 2. The first one, Keppra, didn't seem to be the right one for Luke. Truthfully, I would have been ok staying on for longer. But when we described Luke's occasional meltdowns/rages, the doctor didn't feel comfortable leaving him on it. Keppra is known to cause significant behavior issues and so the doctor felt like it may just continue to get worse. So we weaned off of Keppra and he is now on carbamazepine (Tegretol). Sadly, the occasional meltdowns haven't subsided at all. We'll be in the middle of everyday life.....doing anything really....playing at the park, riding in car, at a restaurant, watching TV, on a walk, at the grocery store....just whatever. And all of a sudden, for no apparent reason, an otherwise happy Luke just FALLS.APART. He starts screaming, crying, kicking and causing all kinds of self harm.....pulls his hair, bites his tongue, scratches his face, seeks out a hard surface and bangs his head repeatedly. It is like nothing I've seen before. It is so intense. It doesn't happen everyday, but far more often than we would like. At this point I would say maybe twice a week. If we happen to be home when it happens....it's rough, but manageable. If we're out and about when it happens...YIKES! There is no talking him out of it. No discipline that can take place. Honestly, I probably wouldn't understand it myself if it weren't for having a child who does this. It is so bizarre and so intense and so incredibly hard to manage. So, say a prayer for me! And for him! When we are out and about, it's usually me with the three kids on my own. And so you can imagine the challenge. Luke has to be restrained (never a fun thing to do) because of the risk of injury. He is strong and seems to have super sonic strength during an episode like this. I'm pretty sure he could just about knock himself out, if he weren't in some way restrained and kept from hurting himself. I videoed Luke's most recent meltdown (they last about 20-30 minutes) and will show Luke's neuro at our next appointment. As terrible as they are, I do want to "wait and see" if this side effect will subside with time. This hopping around from one med to the next is so very much NOT what I want to do. It's rough on a little 5 yr old body. I hesitated to share in detail all his current struggles. But because there are other special needs parents following (and we all learn soooo much from each others' experiences), I wanted to be sure to give a good picture of what like is like for us right now. Despite some grumpy times (and an almost total refusal to wear shoes these days!!!) Luke is enjoying his summer. We are hearing lots of good language, lots of laughing and happy smiles. He's doing so good this year on the "kid-kid swing' (his words for big kid swing) He is fearless and loves to go really high! He'll be our roller coaster lover for sure!